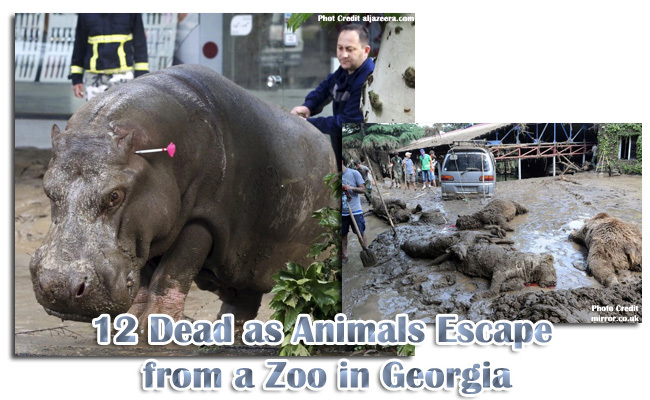 Mayor David Narmania told journalists that at least 12 were dead after animals escape from the zoo in Tbilisi, Georgia. It happened when the water from the Vere River increased that caused flooding brought about by torrential, heavy rain. According to reports, dozens of families lost shelters and thousands of them have no water and electricity in the said city. Roads and small houses were destroyed and cars swept away. Tbilisi Zoo spokeswoman Mzia Sharashidze explained that three dead bodies were found on the zoo’s ground on which two of them were identified as employees. According to her, search for animals continues and added that 20 wolves, 8 lions, and unknown number of jackals and jaguars were either missing or shot dead by special forces. Out of the 17 penguins, only 3 were saved. Rescuers struggled to capture a hippopotamus swimming in the Heroe’s Square in downtown Tbilisi. The scenario was made known to the public after Rustavi 2 television broadcasted a footage of it. The residents were advised to report to authority just in case they will see any of the animals roaming in the city. President Giorgi Magvelashvili extended his condolences to the families who lost their members due to what happened when he visited the affected areas while the clean-up operation is going on. "The human losses that we have suffered are very hard to tolerate. I express my condolences to all the people who lost their relatives," he told a local television.